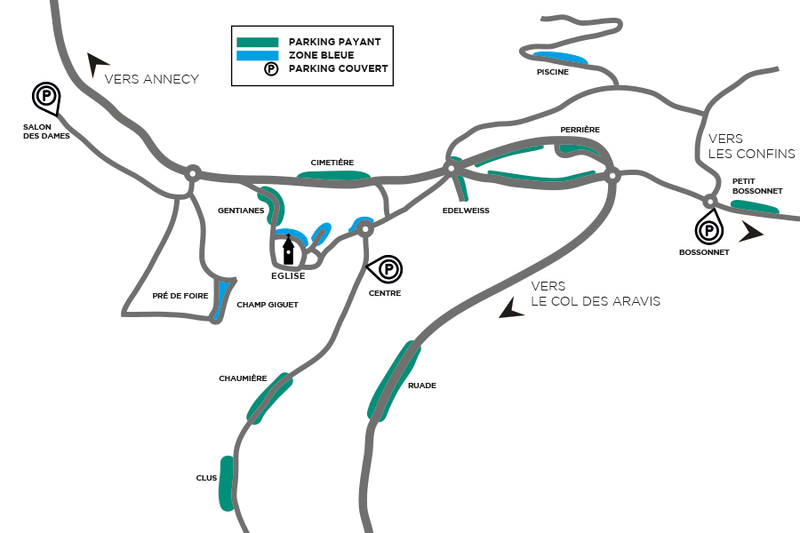 La Clusaz offers you several solutions to park by the day or by the stay. The village of La Clusaz has several blue zones, subject to European regulations. which allow you to park for a maximum of one hour for free (via a parking disc available for sale at the Tourist Office). There are several parking zones on which the duration is limited (24 hours max) and partially free. In winter, take advantage of a " Ski pass + Parking " offer. By parking in the parking lot of the Salon des Dames, you can benefit from the price of 5 € per day (instead of 2 € per hour) if you buy a ski pass. A fast and free shuttle then takes you to the snow front. You park easily, at lower cost and you can leave more quickly after your day of skiing. During your winter evenings in La Clusaz, choose the covered car parks. Your vehicle parks in the underground parks of La Clusaz for 1 € from 9pm to 7am. Spend your evenings in La Clusaz in peace in the covered car park of the Centre, located in the heart of the resort. Near cinema, bars, restaurants and nightclubs. The charging station for electric vehicles allows two vehicles to be recharged at the same time in reserved spaces. Er zijn verschillende gratis parkeerplaatsen buiten het centrum van het dorp waar onjuist parkeren (> 24) van alle motorvoertuigen verboden is. 333 overdekte plaatsen, hoogte beperkt tot 1m80. 24/24 geopend. Gratis in de zomer. 430 overdekte plaatsen. Ingang van het dorp. Hoogte 2,35m. Open 24/24. Onderhevig aan kosten tijdens het winterseizoen. Bus- en busparkeerplaats. Pendelbus vertrek. Betalende, overdekte parking bovenaan het dorp, bij Bossonnet. Het centrum van het dorp heeft verschillende blauwe zones die onderworpen zijn aan de Europese regelgeving.